“If you could have anything in the world, what would it be?” asks Corporal McBurney (Colin Farrell). “To be taken far away from here,” replies Edwina (Kirsten Dunst) in Sofia Coppola’s remake of the 1971 gothic thriller, The Beguiled. Set in the South during the Civil War, a young girl named Amy (Oona Laurence) is out picking mushrooms when she comes across a wounded Union soldier named McBurney. Fearing he might die and being a Christian, she helps the wounded Corporal to an all-girls school where there are a few young ladies, a teacher named Edwina, and Headmistress Miss Martha (Nicole Kidman). Deciding it’s only decent to treat his wounds, Miss Martha instructs the girls to help her take the wounded man inside. They lock him in the music room where both Miss Martha and Edwina tend to his wounds and clean him up. When McBurney awakens, he’s very grateful for their kindness and care but is reminded by Miss Martha that once he’s strong enough to walk on his own, he will be turned in to one of the passing Rebel patrols as a prisoner of war. McBurney piques the interest of both Edwina, who secretly longs to have a handsome man take her away from the school and the war, and Alicia (Elle Fanning), who’s coming of age and anxious to experience physical pleasure. As McBurney begins to heal and gets stronger, he sets out to try to win over Miss Martha, Edwina, and the rest of the girls. He uses his good looks and charm as he attempts to seduce the women in order to stay clear of the war and survive. However, McBurney doesn’t realize just how dangerous these innocent-looking women truly are. Directed by Sofia Coppola, The Beguiled remake is a stylish, well-crafted film with strong performances. However, it simplifies the main characters and comes up short on matching or surpassing the original movie. 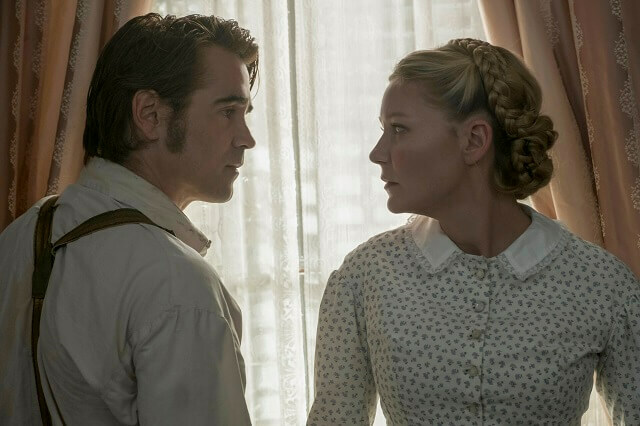 Colin Farrell is solid as Corporal McBurney, the wounded Union soldier whose goal is simply to survive and get away from the war but who’s found himself the uninvited guest at the girls school. Sadly, what’s missing from his character is the depth and deceit that was made clear about him in the first film. Director Don Siegel’s 1971 film used flashbacks to demonstrate that when McBurney (Clint Eastwood) told Miss Martha (Geraldine Page) he was a Quaker and served as a medic in the Army, he was lying to win her trust when in truth he was a rifleman who enjoyed killing. Nicole Kidman’s Miss Martha, like McBurney, has been simplified and purified from the original film. Page’s Martha had an incestuous relationship with her brother when they were younger and she eventually sets her sights on McBurney to fill the void. Kidman’s Martha through most of the film is simply strict and steadfast, only having a mild sense of attraction to McBurney as she washes his wounded body while he’s unconscious. By oversimplifying the two main characters and removing their unlikable traits, Coppola has managed to make an eerie, slowly-paced, gothic sexual drama that centers around uninteresting, one-dimensional people. 2017’s The Beguiled is a disappointment.